Buffalo Check decorative window treatment by Achim, is a popular medium scaled check, with a crochet border trim. Valance has a 1 3/4" rod pocket and header is 1 1/2". Valances & tiers sold separately 60% Polyester/40% Cotton, machine washable. Panels & Tie Up Shade also available. I really love these curtains for my kitchen. The material is so nice and the color is perfect. ProsI love the quality of all the curtains I have bought. The price is amazing to. ConsThe only thing I do not like is the shipping cost. 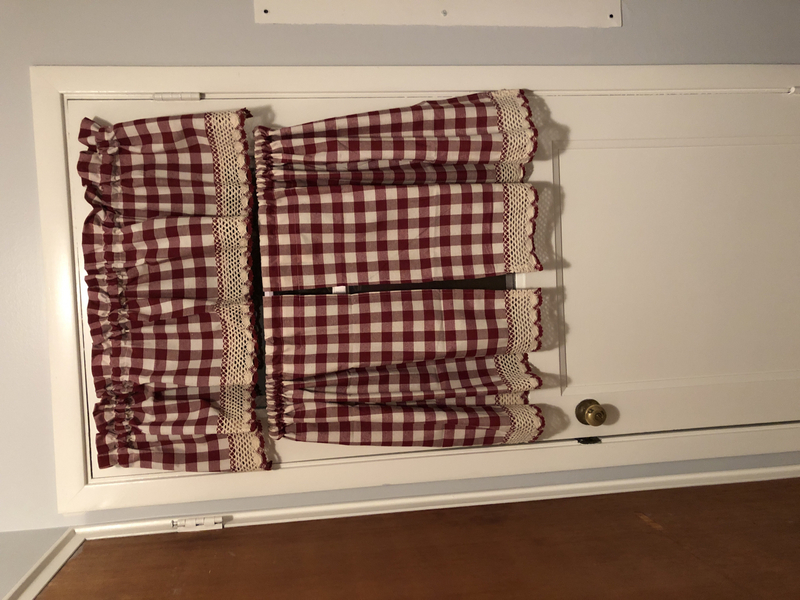 I had to wait two months for a valance to come in and when I bought it the shipping cost was close to what I paid for the valance. absolutely perfect.Arrived so fast and good quality,Look perfect!! I love these curtains. I bought a red set for my kitchen and a blue set for my garage. It adds such warmth and style to my rooms. Well-made, held color after washing. First set I bought a year ago haven't had any problems with quality or sun fading. I am very happy with the valances I bought. I love the buffalo check! They are made of good quality material and look perfect in my 3 kitchen windows.. The valance is a beautiful neutral color. The fabric quality looks like it will resist wrinkles. Perfect for my Christmas Decor! These are so perfect in my kitchen with my holiday decorations. I hung a wreath in the upper window and it looks so festive. These are well made curtains and I got them very quickly. 5 stars all the way! Really cute for the price. Really brightened up my kitchen and arrived quickly. love them.Delivery great as well!! !..very helpful staff when I checked to confirm when delivery would arrive.. I have searched high and low for just the right color and style of valances at a a reasonable price. So thrilled that I found Swags Galore-beautiful curtains, fast shipping, good quality! ProsAs pictured. Used in bedroom. Fast shipper. Fabric and seams are great quality. Love the lace at the bottom. This is my 2nd purchase of this item. Ordered these valances with matching tiers in black. Looks better than I expected. So cute. I recall ordering from this company years ago. (and I still have some of those items!) Great quality, great service. Would definitely recommend to anyone. ordered gray. matched my new kitchen perfect. when you look at them you see gray but not in your face dark gray. with the touch of lace it just sets the curtains and valance off just great. just love them. when I redo my bedroom will most definitely go back to this site. my wife and i liked them right away. shipping pricey. These were exactly what I was looking for, for our country kitchen redo !! The are well made and look so pretty, they go really well twith my red/white kitchen...Love them !! Great Company and Fast Shipping !! I am very happy with the curtains. The crocheted finishing is more intricate than I could see online. I'm very happy with the product. Thank you! I needed a curtain to match my shower curtain and I finally found it. 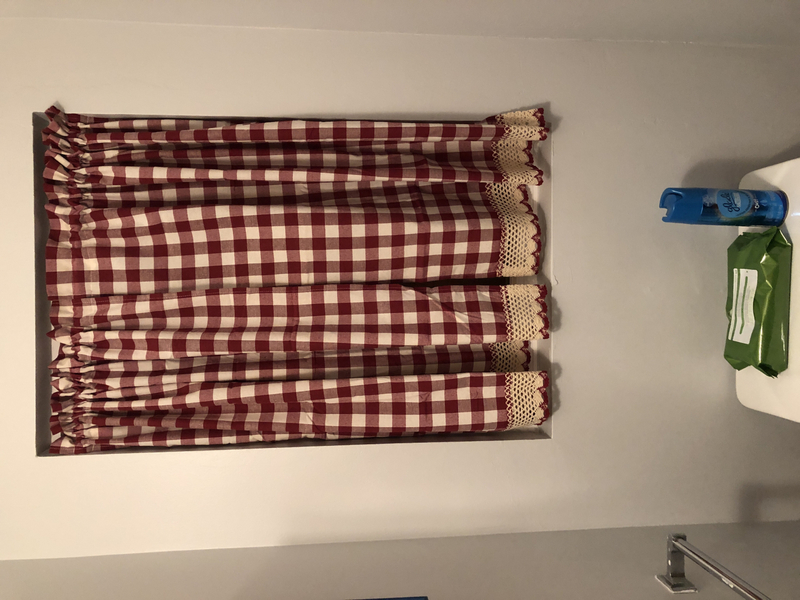 This curtain looks great in my bathroom. The quality of this curtain surpassed my expectations. I would rate this curtain at the same quality as my Country Curtains that cost 3 times more. I am now thinking of ordering two more for my new kitchen in a different color. Very Happy. ProsQuality of the material of this curtain. Also shipping was very fast. Came earlier than expected. I received my order in a timely manner & was very pleased. User friendly to put up & looked great. Wonderful experience and wonderful product. Bought these along with the curtains. They are perfect. They give our modern, updated kitchen a classic charm. They are exactly what I wanted. Love the color! great curtains, good material and hang very well. I got the set and they look great. very happy with purchase. My new curtain go-to place! Very nice, like it! Great prices too!! I ordered 2 to make them look fuller on the rod. Made really well and are exactly as shown on-line.. Great color and very sturdy fabric. Overall, very satisfied with the valancesI ordered in the green. Because I needed five of them for two windows, the only thing I found was a bit of variance in the depths, so had to keep interchanging them until I had the right "look" with those that were side-by-side. Ordering, tracking, and shipping were all excellent. Had to match a particular color in my kitchen and it was perfect. Compared to other sites that were so expensive these look great for much less. Went exactly with my decor. I placed an order for Country Kitchen Valances and tier curtains and got the merchandise in a timely manner. Packed nicely and just as described. I think their service and value of merchandise is excellent. These curtains are made of a strong, soft - cotton weave. They have a nice beige - lace trim, hang well, and look fresh in my kitchen. ProsThey a very pretty, yet casual. They are not contemporary curtains, but county like. I bought the kitchen curtain panels and valances. They were exactly as pictured and described. I love the crocheted panels at the hems. They were very reasonably priced and I was empressed by the quality of each item. They were shipped right away and arrived 3 days after I ordered them. I will definitely shop this site again.